Before jumping into the latest U.S. Mint sales of numismatic products, a quick sentence or two must be thrown at bullion Silver Eagles. 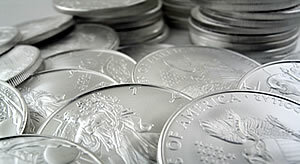 In record year 2011, bullion Silver Eagles did not reach where they are now until October 8, 2011. Moving to numismatic products, weekly sales continued higher for annual sets and commemorative coins. Some of that strength has come from the Mint’s Fall Catalog which was recently mailed to customers and prominently features the products. Across the 5-Stars Generals and Girl Scouts Commemorative Coins, unit sales advanced 2,235 compared to the 2,195 previously. And core annual sets in clad and silver gained 39,945 against the prior 28,952. Sales totals for the commemoratives and annual sets in the week before the catalog hit the street combined to 1,224 and 20,265. Sets and Silver Eagles dominated the weekly listing of top-ten sellers. No coin products debuted last week. This week’s U.S. Mint sales report included updates to 201 numismatic products. Sixty-two of them outperformed their prior weekly sales compared to the soaring 114 total in the last report. Nine products logged unit sales of more than 1,000 versus the 10 previously. Demand picked up for bullion silver coins and was a touch lower for bullion gold coins. The following grid offers weekly and monthly sales for all U.S. Mint bullion products. The weekly period covers sales from September 12 to September 18, 2013. These tables show the latest sales for U.S. Mint numismatic products. The sales period covered is from September 9 to September 15, 2013. Products with an asterisk (*) are no longer available.